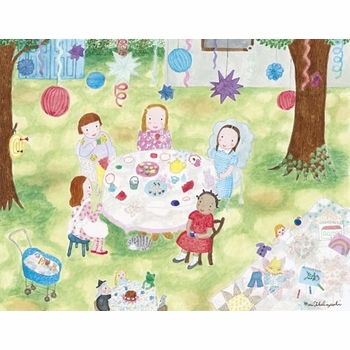 This "Tea Party" wall art from Oopsy Daisy by Mari Takabayashi depicts tea-time parties in a fun and exciting way. A must for the wall in your little girl's room. This top quality canvas reproduction is stretched over wood bars with no glass to break. This piece is made using the Giclee printing process and has the look and feel of an original painting. It is equipped with a wire hanger on the back for easy wall displaying so no framing is required. It can be wiped clean with a soft, dry cloth. Makes a wonderful addition to any child's room, playroom or even beach house. Designed by artist, Mari Takabayashi with biography attached to the back. * Complimentary Ground Shipping on this item; please apply coupon "FREESHIPART" at check out.. 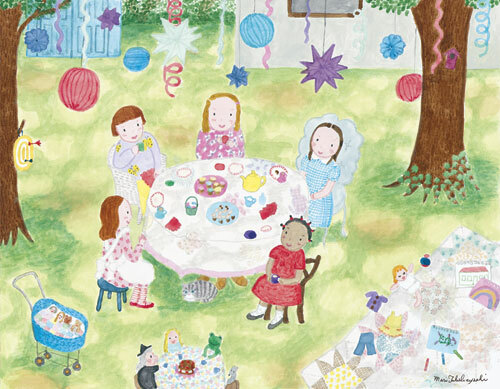 The Oopsy Daisy collection donates a portion of their annual sales to charities that directly assist children. This piece is custom made to order and ships directly from the designer. Gift Box not available.